TRAVEL PHOTOGRAPHY - Extended Version. This is a much more in depth look at how to make good sales from travel photography. It includes most of my previous blog on the subject plus a whole lot more info and some different photos. I've tried to include info that will be useful to most photographers, from 'newbe' to the more advanced stock photographer. *Now if you read the previous blog you may need to scroll down a little (to after the Rio picture) as the first part of this extended version is mostly the same. It is often said that making good sales and income from 'travel' stock is very difficult. YES, IT IS !! - or at least it can be if you don't make your images stand out from the crowd. On Dreamstime, if you do a search using just the keyword 'Travel', you will get well over 2.6 million images come up that have the word 'travel' in their keywords. Now I know that few buyers of travel images will be likely to search using just the keyword 'Travel'. They are going to narrow the search by using keywords that describe the location, specific building or some other key feature of the location they are interested in. Even so, lets say you search for a lesser known destination such as: travel - Myanmar - Yangon. You will still get almost 2500 images. For a well known destination, a search such as travel - New York - Manhattan you get almost 20,000 hits. If you just search for New York you will get over 108,000 hits ! So, how do you increase your chances of making a sale when you are up against so much competition? Most 'Travel' sales are used by the 'Travel Industry' - may seem fairly obvious ! This may be Travel companies, Tour Companies, Travel Magazines, TV Programs (both still and Video clips), Guide Books, Textbooks and Web use etc, etc. Almost all the images used by the 'travel industry' are 'ASPIRATIONAL' - images designed to make you want to drop everything and go there. Probably 90% of all travel sales are of this type of 'aspirational' travel imagery. (Strong, gritty, real life, photo-journalistic images of places around the globe have a good market too, but for the purpose of this blog, we will only talk about aspirational imagery). Two things will increase your chances of making good, regular sales and YOU NEED BOTH TO BE IN PLACE for your images to make more than just the occasional sale. Firstly, your image must shout QUALITY at the top of it's voice. It must show the location, building, landscape, local people or whatever in a way that says 'I want to go there'! Unusual angles, great lighting, strong colors, and local people with character, will all increase your chances. A buyer will scan over a search results page quite quickly, often pulling images 'that catch the eye' into a lightbox, before making a final selection from these. Your images need to jump off the page, and hopefully into the buyers lightbox! Correct color balance, saturation, and contrast. Slopping horizons should be corrected too (again, unless intentional). Try to shoot at a low ISO where possible to keep noise etc to a minimum. Crop your image, if required, to cut out distracting elements so the viewer see's just what matters. Do not 'over-sharpen' your images. Check your image at 100% magnification and remove all sensor dust and other blemishes. Size Matters! - Most of my DT images are 50mb and hardly any are less than 30mb. The larger the file size the more potential uses a buyer can have. This must increase the chances of making a sale. Go large! One thing though, don't just 'upsize' your image, this will just compromise on quality and will probably just get your image rejected. You need to have a camera with a fairly large pixel count that will give you a good sized image. Above: Coral reef in a tropical lagoon at Aitutaki Atoll in the Cook Islands in the South Pacific. HOWEVER - You can have the best image in the world, but without good keywording no one will ever find it amongst the millions of other images on sale. Secondly, you have to make your images stand out. They need to come high in the search results (on the first couple of pages at least). To do this strong keywording is essential !! (Your 'Ranking' also has an influence - more about that below). On DT, the search engine appears to be weighted towards the 'Title' first, then the 'keyword list' and then the 'wording in the description field'. So, it's important to give your image a strong title that uses words buyers search with. For the image below it's no use just putting something like: 'Statue in the clouds' - You need to use words that buyers use when searching. So, 'Christ the Redeemer - Rio De Janeiro - Brazil' is far better. Notice that in the title I leave out words such as 'at, it, and, on, in, to' - this is because the search engine generally ignores them, so for the title, bullet point words are far better. I also usually leave out the word 'the' unless, as above, it is necessary for the title to make sense. You could also add more information that may be useful to a buyer, but you must make sure it's accurate. An Art Deco statue of Jesus Christ, created by French sculptor Paul Landowski. It is 30m (98ft) tall, not including its 8m (26ft) pedestal. 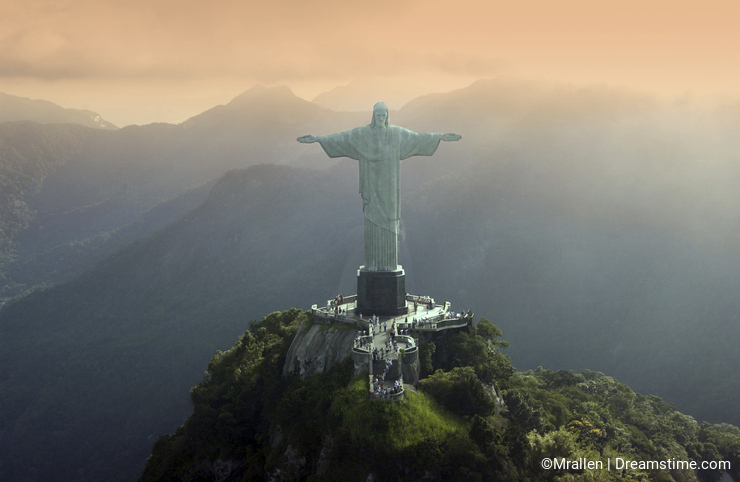 As a symbol of Brazilian Christianity, the statue has become an icon for both Rio de Janeiro and Brazil. The 'Keyword field' should have as many strong keywords as possible. Keywords that describe the location and content of your image. Once again Wikipedia is a great place to find relevant keywords. You could also try using an on-line thesaurus. (on sale since July 2010. Earnings up to 1st June 15). Another thing that has a huge influence on sales in general (not just travel images) is 'RANKING'. Ranking is the level within searches that the Dreamstime search engine applies to your images when it searches for specific keywords. The better your ranking the higher your images will appear in any search. A very good ranking may get your images relevant to that search on to the first couple of pages, a lower ranking means your images are on later pages and far less likely to be seen by the buyer. Most buyers tend to only look at the first few pages of a search. This explanation is a bit simplistic as other factors such as keywording, title wording etc also have a great influence on where your images will come in a search. Now DT don't tell us exactly what makes an individual contributors ranking, so to a some extent this is guesswork. One thing that will make a difference here is the number of new images per month you upload. Constant high levels of uploading seems to increase your ranking. I know this because if I go away on a 10 week overseas shoot and no new images get uploaded while I'm away, I see a drop in sales. I think your 'sales history' and possibly your 'acceptance ratio', and your 'download per image' figures may have an influence too. By the way the number on the 'Stock Rank Wing Symbol' found on your profile page has nothing to do with your Ranking, that is just a bit of competitive fun. 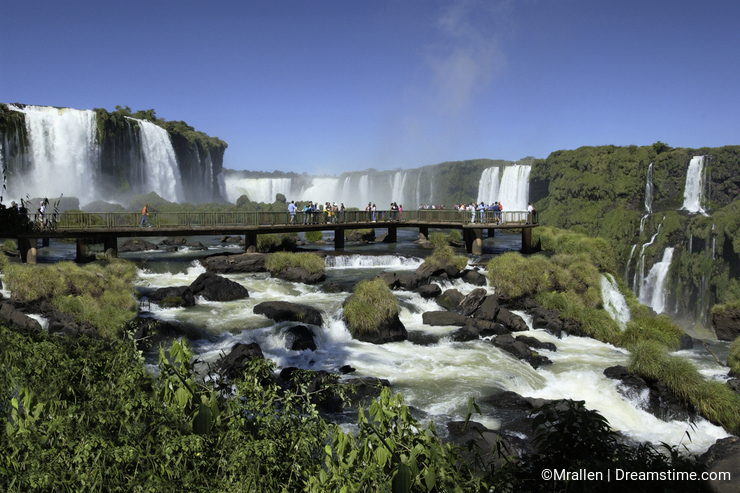 Above: Iguassu Falls on the border of Brazil and Argentina. Iguazu Falls, (or Iguassu Falls, Iguacu Falls, Cataratas do Iguacu, Cataratas del Iguazu, Chororo Yguasu) are waterfalls of the Iguazu River on the border of Brazilian State of Parana and Argentine Province of Misiones. The falls divide the river into the upper and lower Iguazu. Iguacu Falls in Brazil, is also spelt Iguassu, Yguasu or Iguazu. It's important to include all variants in your keywording. Regarding the image above, there are many shots of Iguacu Falls available, but very few show both the falls, the tourists that visit them and the viewing platforms that allow the tourist to get close. Finding a different, unusual angle or viewpoint will help make your images far more salable. This is what business people call a 'unique selling point'. OK, in this case it may not be unique, but I'm sure you get the idea. Above: Selection of 'big cats' - Jaguar, Lion Cub, Male Lion, Leopard and Cheetah. In many popular travel destinations the prime reason people visit is often the WILDLIFE. This is true of Costa Rica, Madagascar, Falkland Islands, the Amazon and many parts of Africa etc, etc. If your travel subject includes wild animals you should include the animals Latin or scientific name, details of the location or habitat and details of any relevant animal behavior. Photography of wildlife merits a whole new blog just on that subject, but I'll just say here that again you need to make your wildlife images stand out from the crowd. They need to be action packed if possible and taken from close up. It's no use submitting images were the viewer needs to look for the animal in your image. Unless there is a reason, such as the need to show the animals habitat, then the animal should fill the frame. Images were the animals are running, jumping, hunting, killing, eating, mating, fighting, flying, swimming, etc will sell far better than static shots. Above: A male and female Red Lechwe antelope (Kobus leche) running from danger through shallow water in the Chobe National Park in Botswana. Above: A young Barn Owl (Tyto alba) hunting at dusk in a church graveyard in Yorkshire in the northeast of England. Obviously, to sell travel images you also need to travel. The more worldwide locations that you can visit the better. To date, I have visited 89 countries on all seven continents, including both Antarctica and the High Arctic. I'm a self-confessed 'Travelaholic' !! Above: The Namib Desert in Namibia, southern Africa. Before visiting my destination I do a lot of research using both guide books and the internet to help me put together a detailed 'shoot list'. Depending on the type of destination I'm visiting and how kind the weather is to me, I usually manage to get between 70% and 90% of the things on my list. I stay flexible though, and if I come across the unexpected I take full advantage. Often I will need to visit a particular sight two, maybe three times at different times of the day, so I can get a shot at dawn or in the early morning sunlight or early morning mist. Then a shot in the late afternoon light and finally a 'night' shot. Night shots should be taken when there is still a little light left in the sky. This will enable you to still see the edges of roofs etc against the sky. If it's too late and the sky is black this probably will not be possible and the top of your subject will just blend into the dark sky. (Museum of Art / National Palace) in the Montjuic area of Barcelona in the Catalonia region of Spain. I often hire a local driver and guide, especially when traveling in the more 'exotic' locations. This may seem extravagant, but it can save me so much valuable time. I don't need to 'find' my location, they take me straight there. A good guide will often come up with ideas, viewpoints and locations that I had not thought of or did not know about. Sometimes their local knowledge can help me get access to places otherwise out-of-bounds to the general public. On several occasions my guides have obtained permission for me to take photographs in places covered in 'No Photography' signs. The fact that the guide speaks the local language, knows the local culture and can guide me through any religious or cultural sensitivities is a great help. They can often smooth the way and help when trying to photograph local people. Often I find that my guide will be willing to be included in my photographs and also to sign a release. A great way to get released travel images! A good guide is a very valuable asset. I travel with the minimum of equipment, but I always carry a 'back-up' camera. To keep the amount of gear I need to lug around each day to a minimum, I usually leave this backup camera in the hotel safe with my laptop etc. If my main camera should fail I may have the inconvenience of a journey back to the hotel, but at least I can continue working for the rest of my trip. I also take a lot of 32gb CF cards on my trips so that if my laptop or backup hard drives fail or are stolen, I still have all my images on the media cards. I try to keep the used cards separate from my other gear at all times, so that if the worse should happen and I get mugged and my gear stolen then I'm only likely to loose the media card that was in the camera. Bad, yes, but at least I can then resume my trip after retrieving my backup camera from the hotel safe and I will not have lost too many images. I never delete anything off my media cards until I get home. I always shoot RAW images to my CF card. My main camera (a Canon 5D Mk111) also has the facility of a second media card (an SD card) on which the camera also records a backup jpeg. Shooting RAW allows me to control all aspects of the final 'look' of the image. If you just shoot jpegs then you are basically leaving everything to the camera's processor and firmware and you will also end up with an image that is 'compressed'. This means that a lot of the original image data that the camera captured is discarded to keep the file size down. NOT a good way to work...... SHOOT RAW ! Above: Shwe Inn Thein temple complex at Ithein (Indein) near Inle Lake in Shan State in central Myanmar (Burma). Try to shoot the 'iconic' locations at your destination first. If a buyer for a magazine is writing an article about a place and only has room for 3 or 4 pictures, they are probably going to choose iconic images that everyone will recognize as being from that place. Shoot this type of image first, these are the 'establishing shots' and these are the ones that really do sell. You may think, 'why bother, it's all been done before' ?? but there is an insatiable demand for this type of image and good images of travel icons usually do well. After shooting the 'establishing shots' move on to other things that show your destination and it's people in more detail. Including people in your shots can really help to sell travel images, especially 'released' people. However, it can be almost impossible to get local people (strangers) to sign a release, so this type of image must be marketed as 'Editorial'. Good Editorial travel images DO SELL ! They are worth doing. Above: Sportsman at the Cowal Gathering Highland Games near Dunoon on the Cowal Peninsula in Scotland. Above: Young novice monks enjoy the early morning sun at Shwe Yaunghwe Kyaung Monastery at Nyaungshwe near Inle Lake in Shan State, central Myanmar (Burma). Above: Tourists landing by ski-plane on the upper snow fields of Mount Cook (Aorangi) on the south island of New Zealand. Mt Cook is 3764m (12,349ft) high. Above: Dancer at the Paro Tsechu (Festival) in Paro Dzong (Jangsarpey Lhakhang) in the Kingdom of Bhutan. Above: A middle aged tourist snorkeling on a coral reef in a tropical lagoon in South Ari Atoll in the Maldives. Above: The Potala Palace in the city of Lhasa in the Tibet Autonomous Region of China. Above: Pre-dawn light on the peaks of the Andes Mountains in Torres del Paine National Park in Patagonia in southern Chile, South America. Above: Temples of the Archaeological Zone in the early morning mist and sunlight - Bagan - Myanmar. Aerial photo taken from a hot air balloon. Above: Aerial view taken from a microlight aircraft in the Sossusvlei area of the Namib-Naukluft Desert in Namibia. (This is a recently uploaded image - only a few sales so far). 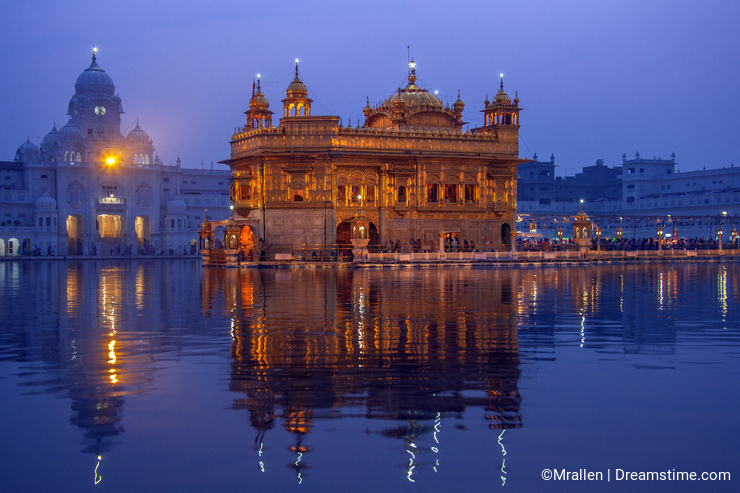 Above: The Golden Temple or Harmandir Sahib in the city of Amritsar in the Punjab region of northwest India. This is the center of the Sikh faith and the site of its holiest shrine. (This is a recently uploaded image - only a few sales so far). The 'Admin' side of travel photography is also important, sorting out flights, hotels, Visas and travel permits is a boring but necessary part of traveling. Safety is paramount and any dangers that your intended destination could throw at you need to be investigated before you travel. It's also very easy to become sick when traveling, diseases such as malaria, dengue fever, typhoid, AIDS, rabies etc should not be underestimated and care taken to avoid them. Even a simple tummy bug can soon put an end to your very expensive trip. If I'm visiting a destination were I think there could be a problem with 'travel sickness' I often take a course of wide-spectrum antibiotics, starting the day before I leave home. This will help to keep you 'immune' from most forms of food poisoning during the time you are on the course, and reduce the risk for a maybe a week or so after the course ends. In all my worldwide travels I have had numerous small problems with tummy bugs, small cuts, sunburn, insect bites, jellyfish stings etc, but I've only ever had one serious problem. This was in Kathmandu in Nepal, I got very sick with food poisoning and became extremely dehydrated and ended up spending 3 days in hospital. I then needed a further few days rest before I could continue my trip, the next leg of which was a month long tour around India and Sri Lanka. If you are planning to visit any mountainous areas, Altitude Sickness can be a real problem and it can also be a killer. It's important to gain altitude slowly over a few days and not fly into an airport high in the mountains straight from sea level. El Alto International Airport near La Paz in Bolivia is one such airport. I have flown into this airport, but it was from Cuzco in Peru, which is also high at 10,400ft. El Alto is the 5th highest commercial airport in the world at 13,323ft (4,061m). The four highest commercial airports are all in Tibet, with Daocheng Yading Airport being the highest at 14,472ft. However the Tibetan airport most tourists will use is Lasa Gonggar Airport near the city of Lhasa at 11,710ft. When I was in Tibet, I crossed a high mountain pass that was over 17,000ft (5180m). That's well over 3 miles (4.8km) above sea level !! Without good, slow acclimatization, I could easily have had serious problems at this altitude. Look after yourself ! If you have problems with altitude sickness the best treatment is a rapid descent to lower levels with 'thicker' air and higher air pressure. Another thing to keep in mind is that the higher the altitude the lower the boiling point of water. At altitudes over 12,000ft this can make a significant difference and water will 'boil' at a good deal less than 100˚C meaning it is not hot enough to kill all the bacteria in your drinking water. You will need to use water purification tablets to make sure your drinking water is safe. I have also traveled to some places at maybe not the best of times to visit as a tourist. I was in Sri Lanka during the civil war. I stayed mostly in the south, but I did venture to within about 20 miles of the danger areas in the north. I was in Jerusalem only a few days before a bomb on a bus killed a lot of people. At the moment I'm trying to get a visa to visit North Korea. It's important to assess any danger and only visit a place with your 'eyes wide open'. It can be a dangerous world out there! You also need to look after your gear. Very hot, humid, dusty or wet weather or very cold Arctic conditions can affect your cameras and lenses. Be prepared and think about it in advance, before you leave home. Ziplock plastic bags are useful for keeping moisture and dust away from your gear. I always carry a few in my camera bag. Polar temperatures can play havoc with camera batteries, making them slow to charge and poor at holding a charge. If your working in very cold areas take extra batteries and try to keep them warm. I carry them in the inside pocket of my coat so they can 'bask in my body heat'. Don't forget to take out adequate insurance both for your camera gear and yourself. From some of the remote destinations I've been to, such as Antarctica, Tibet, Greenland, the South Pacific Islands etc., it can be VERY, VERY EXPENSIVE, so make sure your travel insurance fully covers you for medical treatment AND repatriation from anywhere in the world. Above: The futuristic architecture of the Ciudad de las Artes y las Ciencias (City of Arts & Sciences) in the city of Valencia in the Pais Valenciano region of eastern Spain. The building in the foreground is the Hemisferic. Most people like to travel and many think you can earn money from just taking pictures on your vacations. OK, you can make some sales like this, but to earn good money you need to be a little more serious about it. My trips are pretty intensive and they are 'photography trips' not vacations, although I can't say I don't enjoy myself. Working through a long shoot list can be tiring, but worth it. My portfolio includes a high proportion of travel and wildlife images and on Dreamstime I've just passed $38,700 in total sales. I must be doing something right. I have been shooting 'stock' for about 40 years and since 2001 it has been my sole method of income. Out of interest I thought I would look back and work out what my total income from 'stock' over the last 40 years adds up to. About 70% of this is from after 2001 and obviously we need to take into account inflation - What was a great income 30 years ago is now peanuts. My biggest ever single sale was also in 2006 when one image sold for $24,550 net. This was an RM image (Rights Managed) which sold with 'world exclusive rights and unlimited use for 5 years' - It was a 'travel' image taken in Tahiti in French Polynesia. My biggest single sale so far this year is $4286 - again an RM travel image, this time of Bourbon Street in New Orleans. Many of my best images are RM images and they are NOT for sale on Dreamstime. I thought I'd better also say that the images I currently have on sale across all my agencies are about the 4th collection of images I have produced over the years. I continue to add new material almost every day. Although it's now harder than it's ever been to earn a living just from shooting 'stock', it has, over the years, given me a healthy income, a very nice lifestyle and allowed me to indulge my passion for travel. A large part of my portfolio is made up of 'travel' images and I have managed to make a good living from them. It is possible if you stick with it ! I've been very lucky. I've been able to make a good living from something that I love doing. I think using some of the keywording and other tips I have included in this blog can really help to get your work noticed and increase your sales. I hope you have found this article both interesting and useful, and it has provided some motivation. I hope it has at least 'scratched the surface' of the very complex subject of 'How to sell Travel Images'. Steve Allen FBIPP, FNPS, QEP, FMPA, FBPPA(Grand Master), FSICIP FSITTP, FSINWP. This is my wife, Pauline, who travels with me on almost all my trips. Here, we are on a Russian Icebreaker in the Lamaire Channel in Antarctica. Photo taken at 3am by the light of the 'midnight sun'. A whole class on travel photography in one blog. Wonderful, simply wonderful. I shoot with a canon camera (currently a 5D Mk111) and the lens I use most is a 28-300mm zoom. Most of the shots in this blog were taken with this lens. For most of the wildlife images I used a 500mm lens with a 1.4x convertor. What a great article and display of photos! Do you have a preference/recommendation as to the lens to take when travelling? Yes, there would be a market for such images, provided they are well done. Joining separate images to make a panorama is never easy. Thank you for this article, it's useful and inspiring. Thanks a lot! I will need it ;) And I am very glad that you added one of my photos to your Europe collection! If you find some time, I would be extremely grateful if you could maybe take a look on my portfolio and maybe tell me a few words about my photos. Most of them were taken with crappy lens and without the intention of selling. So I am all the more happy that they were accepted at this and other websites. Glad you found my chit-chat useful. Best of luck. No problem :) Happy to help. And the article is really useful! Thanks for it. By the way, it is my dream to earn money like you (at the moment I am working at the University, but I am not totally happy with this job). I am just starting here, so I do not have any images, yet. So far my work is on other portal selling stock photos, but I think I like this site better, so I am uploading my images here as well right now. Anyway, I am just a beginner and have to learn a lot, but your story gave me a lot of inspiration. Thank you and good luck for the future! I didnt read the article yet, but first thing that struck me is the wrong title of the very first photo... Dude, that is not Hagia Sophia, but Blue Mosque or Sultan Ahmed Mosque. And what is more Hagia Sophia is not a mosque anymore, it is a museum. Thank you for your lesson. A clear explanation and a beautiful photos. A good motivation for me to make better travel photos. Steve, once again, a great blog. Sharing of your knowledge, and your openness is always appreciated. Wow reading this just gives me goose bumps and loads of charged energy. Well done with your article and most importantly well done with your fantastic sales. Hi there. Thanks to Georgeskyrillos, Jordleasy and everyone else for all the nice comments. I enjoy writing these blogs and I always seem to get some extra sales off the images I used to illustrate them. This should be kept on DT's homepage forever! Steve, I must say this is one of the best stock articles I ever read. Congratulations and thanks, thanks again, and thousand times thank you very much! DT don't like it if I talk about other agencies here, so all I can say is it's a British agency called A***Y. Hope you can figure out who I mean. It's 11th on the agency list that's on my website. You have great article in motivating junior like me. Dear Steve, great blog!, a lot of helpful advice! , but maybe someday? I love traveling, because the more I thank you for your inspiration. Thank you for sharing. I will begin using your tips. Beautiful photos! Thank you very much for sharing those secrets. Love reading your post. Yes, I upload jpegs. My camera produces 63.2mb images which after post production work I generally 'downsize' to 50mb and save as tiffs for my archives and then I also produce a 50mb jpeg for uploading. Of course, because of jpeg compression, the file I upload is a lot less than 50mb, but will still open as a 50mb file.